Space Shuttle Docks - Universe Galaxies And Stars Section. Space Shuttle Discovery Docks Safely with the Station. 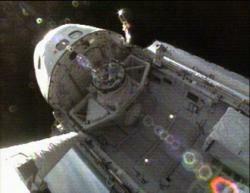 View of Discovery from the robotic arm. Image credit: NASA. The Space Shuttle Discovery linked up with the International Space Station this morning after Astronauts gave it a thorough inspection with the extended boom attached to the shuttle's robotic arm. Just before docking, Commander Steve Lindsey piloted the shuttle into a back-flip, so that cameras on board the station could document any damage to its heat shield. So far, it looks like the shuttle made it into orbit unscathed, even though a few small pieces of foam were dislodged from the external fuel tank during launch. Space Shuttle Discovery reached its destination this morning when it docked with the International Space Station at 10:52 a.m. EDT. The STS-121 mission delivered supplies equipment and a third Expedition 13 crew member to the station. The STS-121 Astronauts entered the station for the first time at 12:30 p.m. EDT. They will spend the next week working with the Expedition 13 crew transferring much needed supplies and hardware from the shuttle and the Leonardo multi-purpose logistics module to the station. Then, the two crews will transfer unneeded items from the station to Leonardo for the trip back to Earth. Leonardo is scheduled to be lifted out of Discovery’s payload bay and attached to the station Friday. European Space Agency Astronaut Thomas Reiter arrived with STS-121. He will become Expedition 13’s third crew member later today. Prior to docking, STS-121 Commander Steve Lindsey piloted Discovery through a back-flip maneuver to allow the station crew to capture imagery of the orbiter’s heat shield.